Holly is the Veterinary Technology Program Chair at Broadview University in Meridian, Idaho. Her interests lie in large animal care and zoonotic disease. During 2011, she had the opportunity to speak about topics related to parasitology at the NAVC Conference, Western Veterinary Conference, and AVMA Convention. Ms. Morss received her AAS in veterinary technology from Globe University in Woodbury, Minnesota. This article was originally published in the November/December 2011 “Today’s Technician” column of Today’s Veterinary Practice. Today’s Veterinary Practice is the NAVC’s official, peer-reviewed journal for veterinarians. You can find the full list of “Today’s Technician” articles on the Today’s Veterinary Practice website. The diligence of the veterinary medical team regarding prevention of disease transmission is critical to the health of patients, clients, practice, and ourselves. What would your reaction be if you went to see your physician for a routine physical examination and you were seated in the waiting room next to a typhoid patient? Imagine the typhoid patient entering examination room #3, where your doctor proceeds to examine him and the nurse collects diagnostic samples. Things at your physician’s office are busy, so you are bustled into room #3 just as the typhoid patient leaves. Your smiling doctor and nurse turn directly to examine you without washing their hands, changing the paper drape, or cleaning any instruments (let alone cleaning the examination room). Do you have a written infection control plan (ICP) for handling infectious diseases in your clinic? Are all of your staff members (receptionists, assistants, technicians, and veterinarians) familiar with the ICP? Has the ICP been reviewed/updated recently? If the answer to any of these 3 questions is no, you have some planning to do. Every veterinary practice, no matter the scope or size, must have a written plan that communicates the handling of potentially infectious cases. Many of the protocols for infection control among patients are the same as those for prevention of zoonotic disease. The clinic’s ICP should dictate the management of any infectious disease, both zoonotic and nonzoonotic. Table 1, ICP: The Crucial Components, lists the necessary elements for this plan. A modifiable Model Infection Control Plan for Veterinary Practices, provided by the National Association of State Public Health Veterinarians (NASPHV), can be found by visiting nasphv.org/documentsCompendia.html. This document provides a framework to begin writing an ICP specific to your facility and available resources. Copies of your ICP (or portions of it) should be available in the reception, housing, laundry, and other applicable areas. However, your practice’s ICP, no matter how well written, is useless if only 99% of staff members follow it. For example, if your weekend kennel staff is not familiar with the ICP, the fastidiousness of the regular weekly staff is futile. The clinic’s ICP should be reviewed and updated at least annually. Changes must also be made, for example, if there are changes in cleaning products or any remodeling that may affect the plan. Whether it’s changing disinfectants (different disinfectants require specific dilutions for a given situation) or installing an automatic sanitation system in the kennel area, make sure that your ICP is updated accordingly (eg, if you have been using Roccal-D [pfizer.com] at a dilution of 1.5 oz/gallon and you change to Parvosan [vetbrands.com], which requires 3 oz/gallon, you must update the ICP with the new information to avoid confusion). Preferably retain a designated staff member when in use. Depending on the disease, this employee should not be allowed to handle patients in the general population after working in the isolation room. For example, feline viral rhinotracheitis (FVR) is highly contagious and can be spread to other cats through contact with your hands or clothing. If a cat with FVR has been in an examination room, no other cats should be in that room for 18 to 24 H. Any staff member that has handled a cat with FVR should not handle any other cats for the rest of the day. The proper personal protection equipment (PPE), including shoe covers, gloves, mask, and disposable isolation gown, should be donned prior to entering the area and doffed prior to leaving. Litter boxes, dishes, and other fomites should be sanitized separately from those used for the general population. The use of disposable husbandry items will assist with limiting environmental contamination. A footbath or mat may be placed at the entrance of the area, however, remember that many disinfectants are rendered ineffective in the presence of organic material. The soles of shoes must be free of debris for the footbath to be effective. One aspect of cleaning that may be overlooked is the use of brooms and high pressure washers. These should be avoided as they can cause aerosolization of any microorganisms present in the isolation room. An alternative to the traditional broom is the use of a microfiber mop with a washable pad (Figure 1). This allows hair and other dry debris to be collected without sweeping and eliminates the microorganism-harboring bristles of the broom. Disinfection should be done by hand to ensure thoroughness and eliminate the use of a pressure washer. The isolation room should also have independent, adequate ventilation to decrease the risk of aerosol transmission. For us and our clients, dedication to continuing education makes a huge impact on the prevention of infectious disease outbreaks. The entire veterinary team should receive continuing education on the recognition of potentially infectious diseases. The goal is to have the staff member scheduling the appointment ask the appropriate questions about the patient’s history and recognize when a case may be infectious to humans or other animals. This staff member can then follow the procedure that your ICP has outlined for handling potentially infectious cases. Ideally, a patient showing signs of infectious disease never touches the waiting room floor. If identified early, these patients can be carried directly into the examination room or brought in through a separate entrance to a designated examination area. All of your staff should have an in-depth knowledge of infectious diseases. This includes modes of transmission (ie, direct, droplet, aerosol, vector, fomite), incubation periods and routes of shedding (ie, urine, feces, saliva, nasal or ocular discharge). This information can be reinforced by periodically reviewing the signs of specific infectious diseases during staff meetings and ensuring that all staff members recognize them. In reading journals like the one in your hands, you have already shown your commitment to staying up to date on best practices. Most of our clients would be just as well intentioned if given the chance. How often do we take the time to educate and re-educate clients on the rationale behind our actions, such as administration of vaccines, deworming, and other regular preventive measures, that we are asking them to purchase? Do your clients really know what a distemper vaccine is? It is easier to complain about client compliance than to take the time to give them that oh-so-repetitive speech. There is no replacement for face-to-face counsel, but there are other ways to reinforce education. Some practices make information on infectious diseases available on their websites. You could also choose to create a client brochure or write a newsletter. Whatever you do, make sure that it is done with brevity and in a language that your clients can understand. A rule of thumb to remember is that it takes approximately 17 repetitions of information for it to be stored in a person’s long-term memory. Don’t expect understanding or compliance after telling a client something once. Dry with a disposable towel and use the towel as a barrier to turn off the faucet and open the door. Hand sanitizers (Figure 4), if used, should be alcohol based. Simply apply to all surfaces of both hands and rub until dry. Remember that gloves are not a replacement for hand sanitation. Hands should be washed or sanitizer used before and after handling each patient, laboratory sample, husbandry item, and before/after use of gloves. The accepted best practice in human medicine is, “Gel in, gel out”; veterinary medical staff should follow the same practice, sanitizing hands when entering an area and again when leaving. The second important sanitation measure is proper handling of linens and other fomites. Laundry should have all grossly visible debris removed prior to washing. It is important to ensure that machines are not overloaded. Laundry should be washed in hot water with detergent and bleach added to every load. Although the use of a hot air dryer promotes the killing of microorganisms, laundry that is stored before completely dry is a perfect environment to promote the growth of bacteria and fungi. Laundry should not be considered clean until completely dry. Items that have been in contact with an infectious patient should be laundered separately. Other husbandry items, such as dishes and raised beds, should be both washed and sanitized; then allowed to dry completely prior to reuse. Cleaning and disinfection protocols must be strictly followed to be effective. Protocols may vary depending upon the type of disinfectant being used. It is important to know the effectiveness of each disinfectant and also the conditions in which it may be rendered ineffective. For example, quaternary compounds lose efficacy in the presence of organic debris or when mixed with hard water. See Table 2, Characteristics of Selected Disinfectants, to review the effectiveness of your clinic’s chosen disinfectant and disinfection protocol. Disease prevention begins with focusing on a pet’s wellness. Reducing a patient stress and, if an infectious disease is present, implementing a wellness plan for hospitalized or boarded patients can increase immunity and prevent outbreak in those patients. The most recognizable instance of this concept is the prevention of feline upper respiratory infections (URIs). Eighty to 90% of feline patients have a latent URI and, when placed in a stressful situation, in 50% of these cats the URI is reactivated.1 This highly infectious combination of viral and bacterial agents can spread like wildfire through your feline population. Providing increased privacy by utilizing kennel covers. Kept on a regular schedule. – Maintain an acceptable temperature without rapid fluctuations in housing facilities. – Avoid or minimize movement between cages. – Spot clean only when necessary; allow pets to keep the same bedding while housed unless it becomes soiled. – Avoid or minimize the aerosolization of chemicals as animals are much more sensitive to noxious odors. If you wouldn’t tolerate substandard sanitation protocols when see your physician, why subject patients to poor infection control? It takes a team effort to effectively implement measures to prevent an infectious disease outbreak. If you focus on planning, isolation procedures, education of team members and clients, clear sanitation protocols, and dedication to wellness, your veterinary practice team can significantly reduce the likelihood of an infectious disease taking hold in your clinic. Canadian Committee on Antibiotic Resistance. 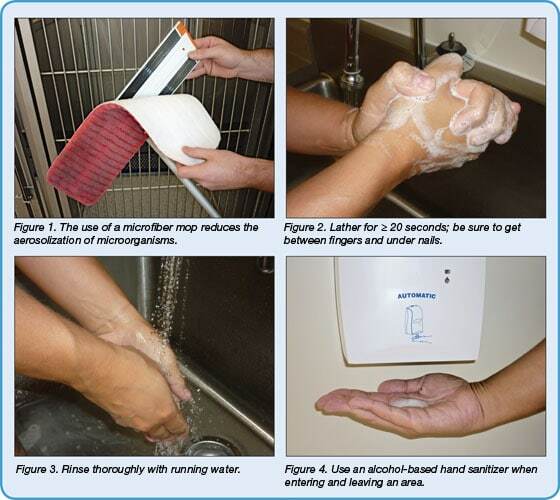 Infection Prevention and Control Best Practices for Small Animal Veterinary Clinics, 2008. Dvorak G, Petersen C. Sanitation and disinfection. In Miller L, Hurley K (eds): Infectious Disease Mangement in Animal Shelters. Ames, IA: Wiley-Blackwell, 2009. Griffen B. (2009). Wellness. In Miller L, Hurley K (eds): Infectious Disease Management in Animal Shelters. Ames, IA: Wiley-Blackwell, 2009, pp 17-38. Hurley K. Outbreak management. In Miller L, Hurley K (eds): Infectious Disease Managementin Animal Shelters. Ames, IA: Wiley-Blackwell, 2009, pp 39-48. Miller L, Hurley K. (2009). Introduction to Disease Management in Animal Shelters. In Miller L, Hurley K (eds): Infectious Disease Management in Animal Shelters. Ames, IA: Wiley-Blackwell, 2009, pp 5-16. Veterinary Infection Control Committee. Compendium of veterinary standard precautions for zoonotic disease prevention in veterinary personnel. JAVMA 2010; 12:237. Levy J, Hurley K. Controlling feline upper respiratory infections. ufsheltermedicine.com/documents/FelineURI_Levy.pdf, accessed November 5, 2011.